I've been planing this post for a while - and I'm super excited that it's going live today. I love "What's in my purse posts" because I'm curious to know what other people carry around with them (does that make me nosy...?). My purse can be likened to the tiny bag Hermoine carries in Deathly Hallows. It's basically bottomless and usually has just about everything in it. Just before heading back to school, I emptied my purse and this is what I found! The bag I'm currently carrying is the Kate Spade Southport Ave Linda in Flame. It's really spacious and has a fun tassel detail on the front. I also always keep my phone and headphones in my purse too! 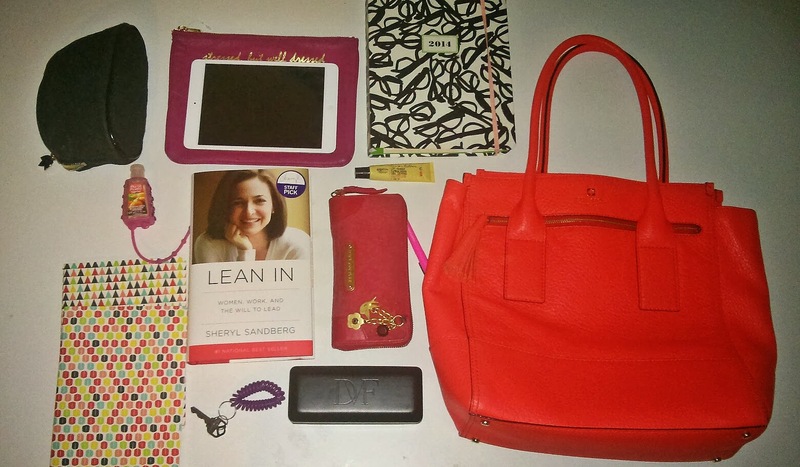 PS: I know that everything is arranged super neatly here, but the truth is my purse is almost always a disaster zone. It's terrible and definitely something I'm working on. Love your bag! I really want to read Lean In this semester! I've heard nothing but good things about it. I just did my "What is my bag" post yesterday! Feel free to check it out! Definitely a great read! I keep it in my purse so I can read it whenever I have a spare moment! I think I would keep my ipad in my purse if it wasn't already so heavy....my phone usually serves the same purpose though.